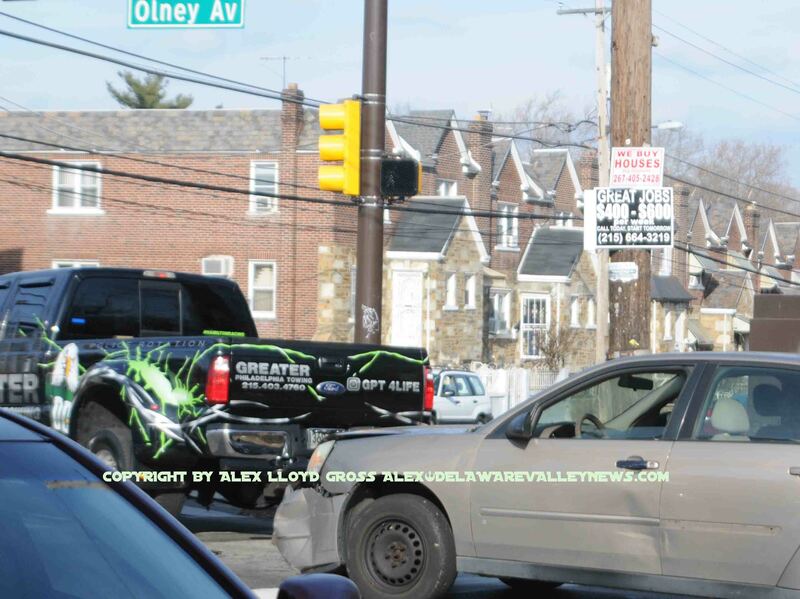 Alex Lloyd Gross photo- Delaware Valley News.com A wreck chasing tow truck is towing a crash from Olney without the cops showing up. Now both drivers have different versions of what happened . Philadelphia has always been prone to wreck chasers, people who drive tow trucks, go to accidents and then try to tow the cars to a shop or yard. Some of these people have charged outrageous fees. About a decade ago, the city put forth a new tow rotation system that worked part of the time. Starting January 23, 2019 A company called Auto Return will be in charge of dispatching trucks. There is some good and some very bad associated with this new company and the procedures they will use. First, the good. frequently, in areas of the city , especially Olney and South Philadelphia, unscrupulous tow operators will use spotters or cruise the streets looking for crashes. They will convince the people involved that police are not coming and get them to sign a tow contract. They then hook up quickly and leave with the vehicles before the cops come. They may even take the accident victims to their yard to shop for a rental, imploring them to then go to the district to do a police report. The poor motorist has to pay outrageous fees to get the car back This stops that practice dead in the water. Prices are capped at $215.00 for cars and light trucks. There are no more administrative fees, hook up or disconnect fees, lot fees, dolly fees. It is these made up fees that drive up insurance premiums. Now, the tow driver will take your car anywhere in the city for $215.00. There is a $25.00 per day storage fee. Some of these tow trucks had misleading lettering on them indicating they were official police tow. They might have been approved to be on tow rotation but they were not called to your crash. Now, Auto Return will dispatch via a cell phone alert to a company next on the list. Only that company should respond. They will have confirmation to show the police. No confirmation, no tow. The tow operators have an app on their phone, which when turned on uses GPS technology. If Harry’s was dispatched, but John’s shows up, Auto Return will know about it. They will know when the tow operator shows up, how long they are there and if they were not dispatched by Auto Return, they could be taken off the list and lose the contract. 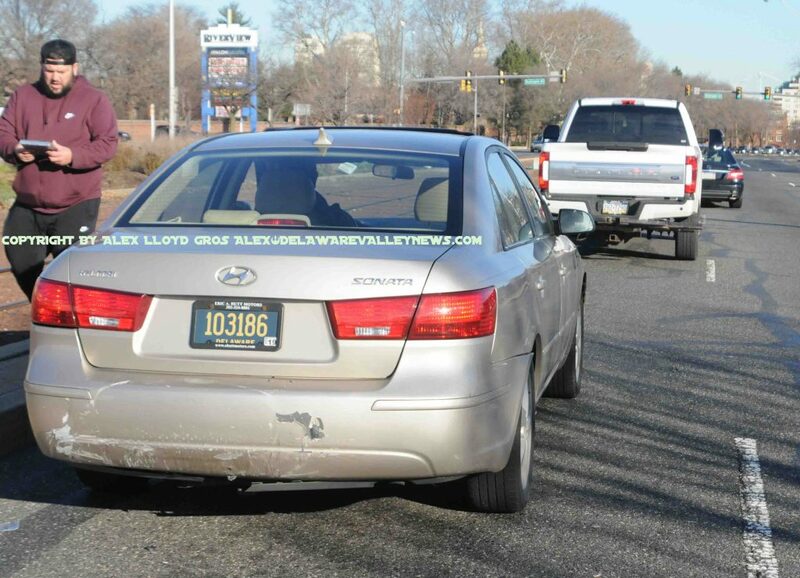 Alex Lloyd Gross Photo- Delaware Valley News.com A wreck chaser tries to hustle people for a tow before the cops show up. He is driving a truck with no warning lights (pick up truck) and is in violation of OSHA regulations regarding traffic vests while working on a roadway. If a tow driver turns off his app and goes to the scene, Auto Return will never know about it. So let’s go back to John’s and Harry, who are friends but have competing businesses. They cannot call each other to cover or to help remove vehicles. They can call other trucks within their respective companies only.. The huge problem with this program is that a motorist is not permitted to get their own tow. That means any auto clubs that send wreckers are going to be sent home. Motorists will be furious at having to pay a fee of $215.00. The tow operator is not going to push the vehicle to the shoulder and let the auto club take it. This will lead to heated confrontations at crash scenes. Only this time it’s between an Auto Return dispatched truck hustling for money or the crash victims own tow. If you own a body shop, you cannot call your own truck to tow your own vehicle from the scene. you MUST pay this fee, of which $22.00 out of every car goes into the coffers of Auto Return. According to city spokesman Mike Dunn, People can retrieve their personal belongings for free from their vehicles. “If your vehicle breaks down on the highway and is not blocking anything, you are free to use your own tow. If the vehicle has been in a crash, the tow must go through the rotational program,” Dunn wrote when asked about the company. Dunn also said that tow drivers that arrive where someone has been taken in an ambulance must wait until the arrival of police before removing any vehicle from it’s resting position. Failure to adhere to this could eventually lead to confiscation of the tow truck and charges against the driver, even if they were called. Tow trucks are required to carry safety equipment. If a driver is struck by a car or hurt, neither the city or Auto Return is liable, , Dunn said. drivers usually will have 20 minutes to get to a scene. Unusual circumstances (like weather) may cause unforeseen delays. Tow drivers are not permitted to speed or drive through red lights to get to their tow. Customers with a complaint can contact Auto Return, who will forward that complaint to the city. If a tow operator arrives on a rotational call and their services are not needed, they get put back on the to of the list.